Offering you a complete choice of products which include duratac chrome and color badges. 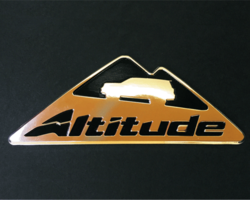 We manufacture worlds best Duratac Chrome And Color Badges that is widely accepted across the world. The pre-sensitized labeling process is a patented one and the technology is owned and patented by a US based company viz. Horizon Inc., Cleveland, Ohio. Chrome Badges , Chrome Labels ,chrome Letters ,chrome Logos, Vehicle Logos , Chrome Stickers, 3d Chrome Badges ,chrome Brandings.